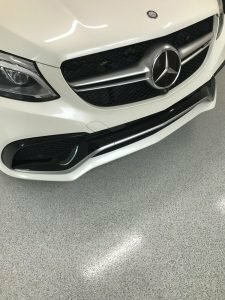 There was a time when “epoxy” flooring was considered a luxury in garage flooring. Today, full flake broadcast floors are becoming standard in new home construction as the popularity has skyrocketed. Family owned and operated since 2008, Indy Floor Coating specializes in beautiful, protective coatings for all concrete surfaces – from upgrading or repairing garage, basement, outdoor and commercial flooring, to creating stunning metallic reflective finishes to enhance any space. They use only industrial-grade coatings for superior durability and abrasion-resistance. Around this time of year, Knight fields calls from customers looking to redo their garage floors in preparation for graduation parties and other spring soirées. In addition to the aesthetics, coating the floor protects your investment in your concrete, prevents cracking and pitting (common from road salt), is easy to clean and is maintenance-free. “All the gunk that gets on the floor during the winter can be squeegeed out, making the surface shiny all over again,” Knight says. Concrete coating is an economical way to have a big impact on home improvement. For residential, the company coats garages, porches, patios and basements. They also do commercial kitchens, restaurants, warehouses, athletic venues, automotive and medical and dental facilities. With spring, however, the garage floor business really ramps up. Indy Floor Coating is located in Fishers. For more information, call 317-430-0851 or visit them online at indyfloorcoating.com.